Finally! 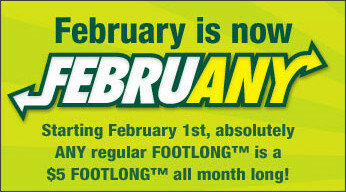 The $5 . . .$5 footloonnnggggssss are coming back starting February 1st! I was really excited to just receive an email about this upcoming promo because the other day I went in to get a turkey footlong and my total came to nearly $10 (well, like $9) but that's way too much for a crunchy dealer to pay! Oh, and if you have the Entertainment Book, you may find some coupons! Do you know of any other coupons out there? !